DOMO has recently announced a new Android tablet with 3G calling feature and an affordable price tag to challenge the competent. This tablet can be a good option if you’re looking for best Android tablet with calling facility but this isn’t going to be a showstopper. The tablet is named DOMO Slate X3G 4th. The DOMO Slate X3G 4th measures only 10 mm in thickness while length and width are 192 mm and 108 mm respectively. The tablet weighs just 315 grams which is an impressive factor. It features 7 inch LCD capacitive display with resolution of 1024×600 pixels and supports up to 5 point multi touch. The display also got fingerprint resistant coating just to ensure you don’t find fingerprints on the front. 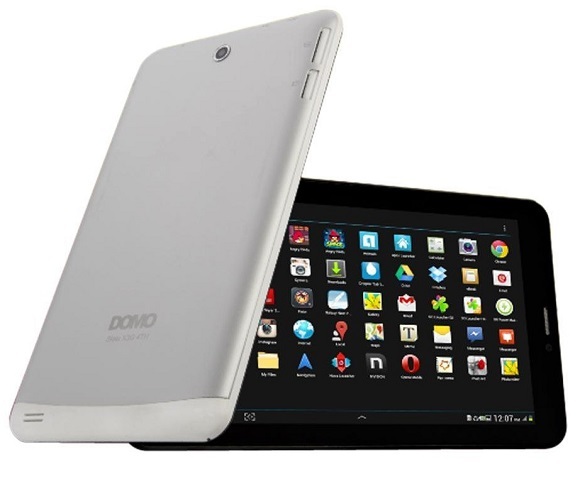 The DOMO Slate X3G 4th is powered by a quad-core Cortex A7 processor with 1GHz of clock speed. It also got PowerVR GPU with dedicated 8 cores and support for OpenCL, OpenGL ES2.0 and DX 9. There is 1GB DDR3 RAM inside to look for the storage requirements of the CPU and GPU. This CPU combination is good enough for productive apps and also even for high definition gaming apps. Tablet also got accelerometer and gravity sensors to further assist the game play and also the navigation. The tablet got 8GB of internal storage and it can be expandable up to 64GB using traditional microSD card. Homeshop18 is providing 16GB microSD card for free with the tablet. The best feature of the DOMO Slate X3G 4th is that it runs on Android 4.2.2 Jelly Bean which is one of the best and popular versions of Android around the world. Though it isn’t the latest version but still it’s better than the previous version of Android. The rear and front cameras are 5MP and 3MP respectively. The rear camera got CMOS sensor and it’s also capable of recording full HD videos. The connectivity section got Wi-Fi for wireless data connectivity along with 3G cellular data and microUSB and HDMI ports for data connectivity though wires. The DOMO Slate X3G 4th got 3200mAh battery and the official battery life is said to be 2-5 hours while accessing internet via Wi-Fi. The stand by time is said to be 120 hours. The battery life isn’t impressive but it’s better than all other tablets available in this price range. No doubt, the specifications of DOMO Slate X3G 4th are impressive and battery life is also acceptable but still it’s hard to believe that DOMO will provide better service via their service centers. If you don’t care about the service center issue and just looking for an affordable Android tablet with 3G calling feature then you can buy DOMO Slate X3G 4th by paying only Rs 9,999 from Homeshop18.com. The actual price of DOMO Slate X3G 4th in India is Rs 14,999.